To Hilary, I’m having a great time. On Sun we went on some go-karts motor ones it was great fun. Today we went to Arlington Court and yesterday we went to Lynmouth and Lynton. Tonight we might go fishing. The farms nice and they have a lamb that comes to you and 3 horses and sheep, cows and chicks bye for now Helen. As this is postmarked ‘Tunbridge Wells 1.15pm 9 Aug 1976 Kent’ it would appear to have been posted after Helen returned from her trip to Devon. The other postmark reads ‘National Savings Diamond Jubilee 1916-1976 Go on saving at The Post Office’ – the Post Office promoting its savings schemes. Helen went to Devon regularly, often staying on farms it seems. 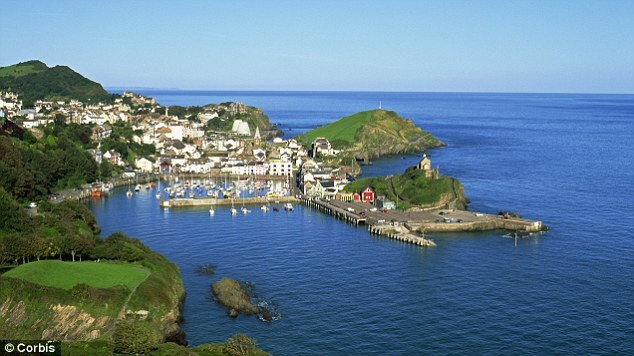 Ilfracombe remains much the same with that beautiful blue sky on the odd summer’s day; the white Royal Britannia Hotel on the right hand side is still a popular place to stay. 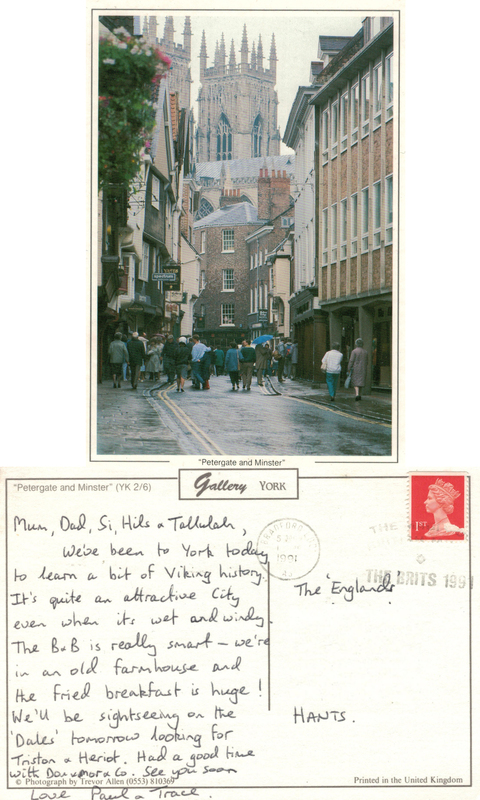 I am increasingly sad that I lost touch with Helen, as we obviously exchanged cards for some years after I moved away from the area where we were at primary school together. 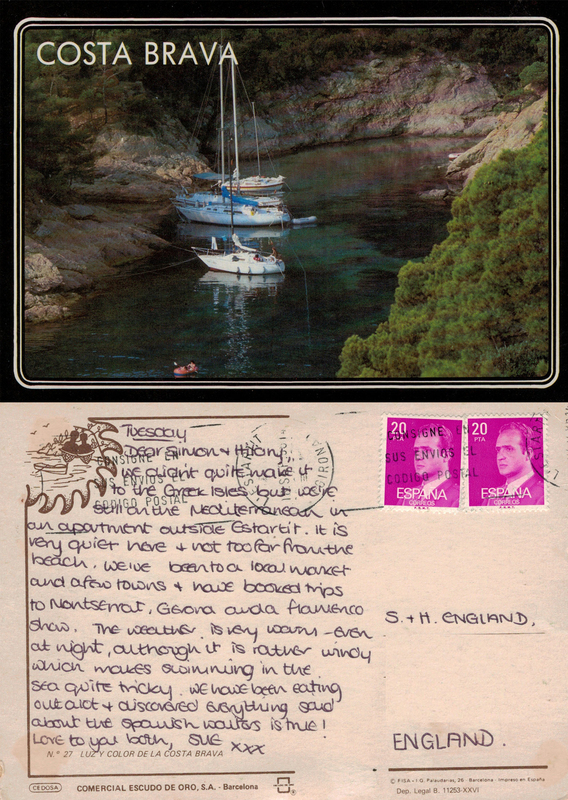 Post marked ‘L’Estartit 18 Sept 86 Girona’ with the additional post mark message ‘CONSIGNE EN SUS ENVIOS EL CODIGO POSTAL’ which I believe roughly translates to ‘Always use the post code’. Lots of information is being shared, although there is no clue as to why they didn’t make it to Greece; likewise no clue as to who is with her on holiday – their name is excluded from the signature so I can only assume that we did not know her travelling companion. The picture is not referenced on the reverse but, having visited the area some years ago, I can confirm that it is typical of the rocky coast of the Costa Brava which features many, tiny hidden coves and is probably best explored from the water. It’s ‘AIR MAIL’ postmarked ‘PM Palm Springs CA 15 May 1991’ and carries a 40 cent stamp featuring Lillian M. Gilbreth which is one of the Great Americans series of stamps. 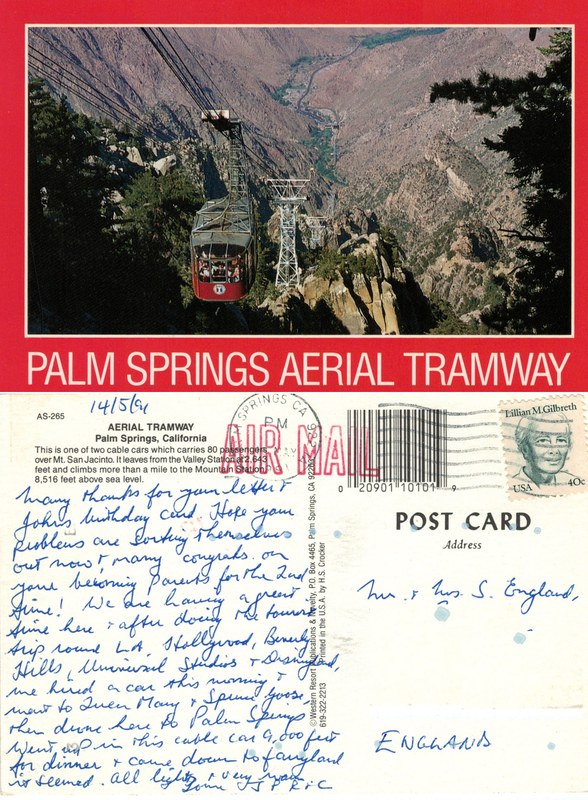 The picture is of the Aerial Tramway, Palm Springs; the cars seem to have been updated since 1991; the spectacular views are much the same. 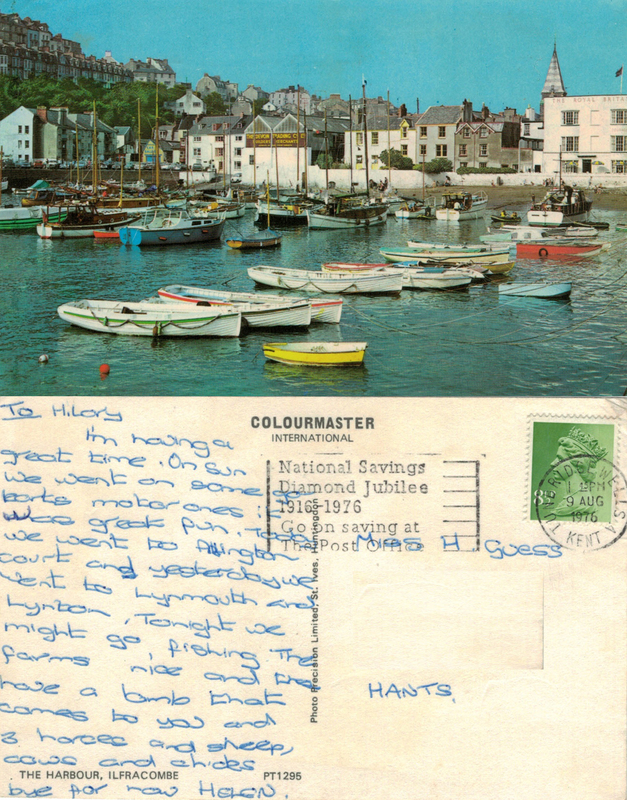 John, mentioned in the text, was my Dad’s childhood friend – their mothers were good friends – although he sadly died, suddenly, a few years after this card was written. The ‘problems’ mentioned refer to the UK recession of 1991 which caused many people, including us, to go into negative equity and lose their homes. Recessions/Banking Crises come round regular as clockwork it seems! The comment about being parents for the second time proved premature as we subsequently lost the baby early on in the pregnancy – it was a bad year. The friendship between the two families continues into the third generation and now spans over a hundred years! Inevitably, the weather features in the text, together with a descriptive status update on the accommodation and food. ‘Triston & Heriot’ refers to the popular TV series ‘All Creatures Great and Small‘ which was set in the Yorkshire Dales. This card is written by Paul, who was, and still is, my brother-in-law. Tracey was, and still is, his wife. Presumably Simon (and Paul’s) parents were staying with us over the period as they are also addressed, along with our daughter, Tallulah, who was just a baby at the time. Lots of family info here as there is mention of Uncle, Aunt and cousins on Simon and Paul’s Mum’s side of the family – phew! We see Paul and Tracey regularly, along with ‘Mum & Dad’ and ‘Don & Mor & Co’ at family gatherings.